Dr Nic Slocum, Managing Director of Whale Watch West Cork and chairman of the steering committee of the Planet Whale responsible Whale Watching Partnership, has been invited to attend the IWC Whale Watch Operator’s Workshop on 24th-26th May in Brisbane, Australia. The IWC is drawing on operator expertise from around the globe during this two day workshop to assist in the implementation of it’s five year plan for sustainable whale watching. This will cover issues such as the use of whale watching boats to gather meaningful scientific data; systems for monitoring adverse impact of whale watching on cetacean populations; how to share expertise between whale watching nations, building responsibility for sustainable whale watching within the industry and the creation and development of an adaptive management framework. The IWC has been considering the issue of sustainable whale watching since 1975 and adopted its first resolution on global whale watching in 1993. 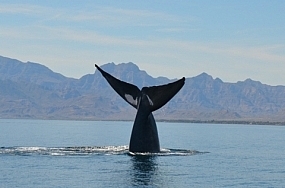 In 1998 a standing whale watching sub-committee was set up under the existing scientific committee and has since addressed a range of matters concerning the sector. Much of its work has focussed on better identifying, assessing and understanding the impact of whale watching on whale communities both large and small. “…I am delighted to attend this important international workshop and contribute some of the momentum we have achieved over the past nine years with Whale Watch West Cork through the development of species specific codes of conduct. With whale watching becoming an increasingly important and unique tourism attraction off the south coast of Ireland, it is imperative to draw on the expertise of others around the globe. This will ensure we develop a workable framework for best practice down to the species level that may be applied as a benchmark for those developing whale watching operations for the first time…” Dr Slocum said. Whale Watch West Cork is dedicated to providing our customers with a safe, comfortable and educational whale and dolphin watching experience. We seek to impart detailed knowledge on the marine mammals and other wildlife we encounter and on the wider issues of marine conservation through informed commentary with special emphasis on the current threats facing these unique animals and their fragile environment. Planet Whale is the global community that will change the way we view whales and dolphins forever. By harnessing the passion and ideas of individuals, we will achieve more to protect and defend our oceans than ever before. The International Whaling Commission is an Inter-Governmental Organisation tasked with the conservation of whales and the management of whaling. It is set up under the International Convention for the Regulation of Whaling signed in 1946. The Commission has a current membership of 89 Governments from countries around the World.